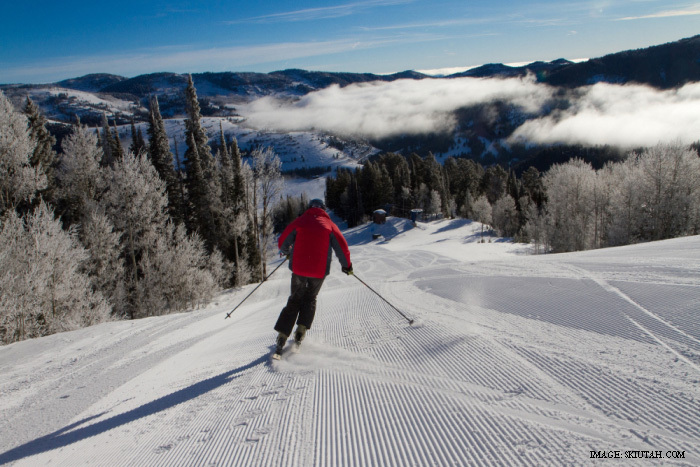 Beaver Mountain is a ski area located 27 miles northeast of Logan, Utah, and three miles south of the Idaho border. Known by locals as "the Beav," Beaver Mountain is very popular with residents of Logan, the Bear Lake region, and southeast Idaho. At the time it opened in 1939, the resort was comprised of just one cable tow. Today, Beaver Mountain has six chairlifts and more than 42 runs for skiers, snowboarders, and cross-country skiers. The resort also offers a day lodge with a restaurant and full-service ski shop. For overnight lodging accommodations, patrons may stay at the nearby Beaver Creek Lodge or the Beaver Mountain Yurt. The yurt is available for rent for overnight stays, family parties, company retreats, and more. Those who stay in the yurt are treated to breakfast with the staff and are open to the first runs of the day on the slopes. At a base elevation of 7,200 feet, Beaver Mountain receives an average snowfall of 400 inches per year. The resort has a skiable area of 664 acres, and the terrain is diverse to suit skiers and snowboarders of varying skill level. About 35% of the terrain is suitable for beginners; 40% is designated for intermediates; and 25% is meant for only skilled skiers and snowboarders.